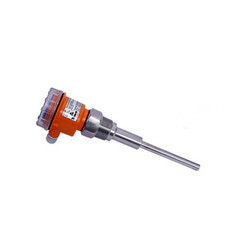 We are offering the best quality of Level Switch to our customers. Electronics of LFV12 excites the piezo-electric-crystals inside the tuning fork, which makes the fork tines vibrate at their natural resonance frequency in free air. 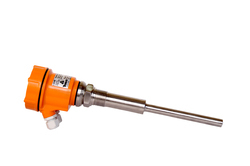 When the fork tines are immersed in liquid, the frequency of fork vibration falls due to the density of the liquid. When no material is present, the capacitance is analogically a multiple of probe dimension and dielectric constant of air. When the material is present, the capacitance gets multiplied by dielectric constant of the material. This variation in capacitance is then translated into switching output by the device. Suitable for non-sticky liquids and solids. 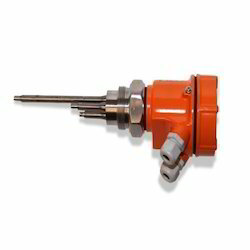 Single point/multipoint/pump control switching on single probe. PTFE coated for corrosive and conductive liquids. 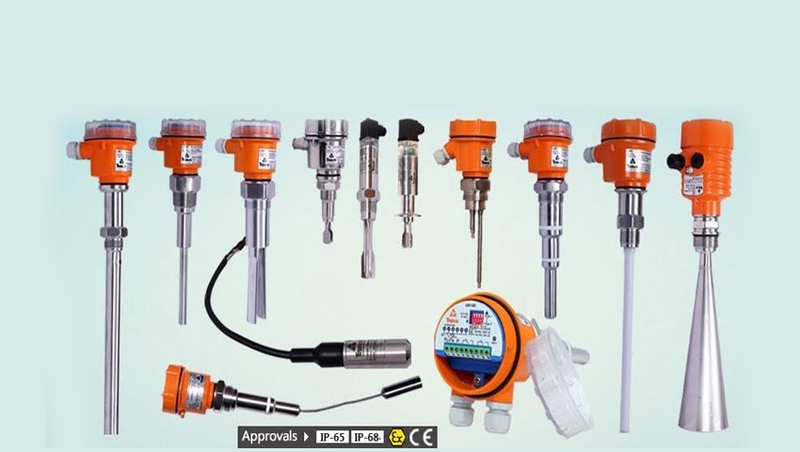 Customized process connections like Threaded/Flanged/Hygienic etc. Electronics of LSV excites the piezo-electric-crystals inside the tuning fork, which makes the fork tines vibrate at their natural resonance frequency in free air. Amplitudes of vibration are above threshold when tines are free to vibrate. When material touches the fork tines, vibration stops as resonance gets disturbed. Amplitudes of vibration, as sensed by electronics falls below the threshold strength, material presence is thus detected. Free flowing powders and granules. Various customized process connections. Starting from 1" threaded size. Settable switching delay as a standard feature. Electronics of LFV12 excites the piezoelectric crystals inside the tuning fork, which makes the fork tines vibrate at their natural resonance frequency in free air. This change in frequency is detected by an electronic circuit. Suitable for all non-sticky liquids and solids. Suitable for the side as well as top mounting. Single point/multipoint /pump control switching on a single probe. PPTFE Minimum and maximum fail-safe field selecta PTFE coated for corrosive and conductive liquids. Compact size, Low power consumption. The remote electronic version available on request. Single point/multi point/pump control switching on a single probe. Minimum and maximum fail-safe field selectable. Universal industrial power supply. 15 to 80 VDC & 15 to 260 VAC). 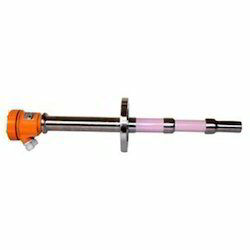 Vibrating rod is a single element tunned mechanical element-type level sensing device. Electronics of LSV-R excites the piezo-electric-crystals inside tuning rod, which makes the rod vibrate at it's natural resonance frequency in free air. When Material touches the rod, vibration stops as resonance gets disturbed. Amplitudes of vibration are above threshold when rod is free to vibrate. Amplitudes of vibration, as sensed by the electronics falls below the threshold, Materials presence is thus detected by observing the amplitude of vibration. Universal industrial power supply. 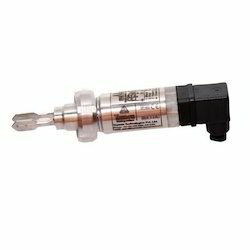 (15 to 80 VDC & 15 to 260 VAC). 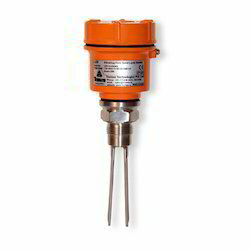 From past many years, we are engaged in offering an excellent range of Capacitance Points Level Switch to our clients. Liquids, fluid packing/ bottling applications etc. 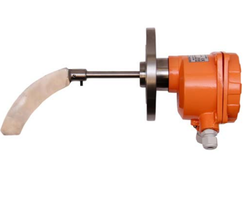 Rotating paddle level switches are basically a spring loaded, eccentrically driven rotating vanes (or blades) which rotate at one revolution per minute, using an AC synchronous motor. When no material is present, rotating vanes, (or blades or paddles) are free to move and the motor is held by a spring in its normal position. When the material reaches the rotating vanes, it tries to stop the rotation of vanes, causing a reverse rotation of motor and stress in the spring which is holding the motor. When the motor rotates to a degree where limit switch is present, the power to the motor is turned off and output is generated. As soon as material level falls, the vanes become free to rotate once again, causing the motor to turn back to its normal position due to stress on the spring holding the eccentric drive, synchronous motor. 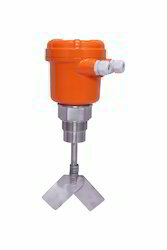 Various sensing fins option available for different bulk density material. Packaging Details: Corrugated Box, Wooden Box. as per requirement. sealing to prevent dust penetration. Different types of blades (vanes) available. Process Temperature max 150 deg C.
Electronics of LFV11 excites the piezo-electric-crystals inside the tuning fork, which makes the fork tines vibrate at their natural resonance frequency in free air. When the fork tines are immersed in liquid, the frequency of fork vibration falls due to the density of liquid. All liquids from free-flowing to viscosity up-to 10,000cP. Various customized process connections like Threaded/Flanged/TC etc starting form 1/2". Keeping in mind the varying necessities of our customers, we are readily involved in bringing forth a comprehensive Ash Level Switch. 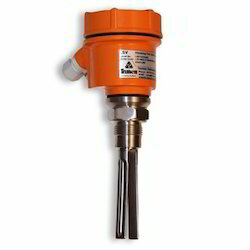 We have the expertise to supply and export a wide range of RF Capacitance Level Limit Switches. These products are tested as per the international standards of quality to make sure it exhibits high performance without any delays or interruptions. We can also customize these fittings as per the requirements and needs of the clients. Acids (PFA/PTFE & Halar coated), food processing liquids, fluid Packing/ bottling applications etc. Flow-No-Flow/Empty Pipe Detection. 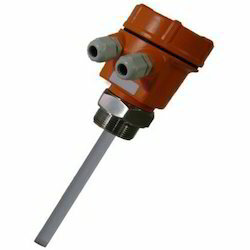 Vibrating fork level limit switch used as a full, empty and demand alarm in fluid containers, tanks containing liquids of various types. Free flowing powders and granules (size max. 10mm).Suitable for the side as well as top mounting.Minimum and maximum fail safe field selectable. Compact size.Universal industrial power supply (15 to 60 VDC & 15 to 260 VAC).Low power consumption.No calibration required.Customized process connections like Threaded/Flanged/Hygienic etc.thread starting from 1" size.Settable switching delay as a standard feature.The remote electronic version available on request. Various customized process connections like Threaded/Flanged/TC etc starting from 1/2". 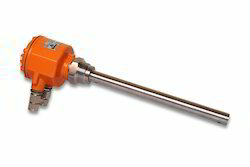 We are offering the best quality of Vibrating Rod Level Switch emerges as a product that is high in performance and comprises of well-tested design. Contact of in-house switches changes with movement of floats in corresponds to rising/falling of liquid Level inside the tank, thus giving potential free contact outputs. 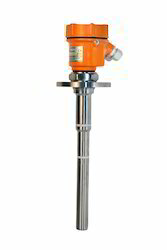 The sensors are custom made in top mounting versions in SS / PP construction. Top mounted models are available in single or multi-level sensing types in various lengths. DPDT Relay O/p for Better Automation. Adjustable Time Delay for Dry (Uncovered) & Wet (Covered) Probe to avoid relay chattering. Pressure Die-Cast Enclosures with IP-68 Ingress Protection as per IS 13947 with PU Epoxy Coat. Low Power Consumption for Longer Electronic Life. CE Certified products as per European Standard. 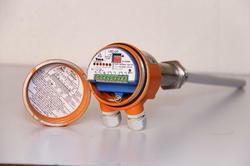 Pump Control Level Switch is used in small tanks and equipment. Hermetically sealed reed switches are enclosed inside the sensor stem, which is actuated by the magnetic floats. These are specially designed to encapsulate permanent magnets inside them. These also traverse up / down or tilt outside or on one side of the sensor stem.